There is a winery about 45 minutes away from Bonnieux which had some interesting contemporary architecture and site installations, so we were told. We made a trip there with some friends to have a look, a picnic and enjoy a spring day. 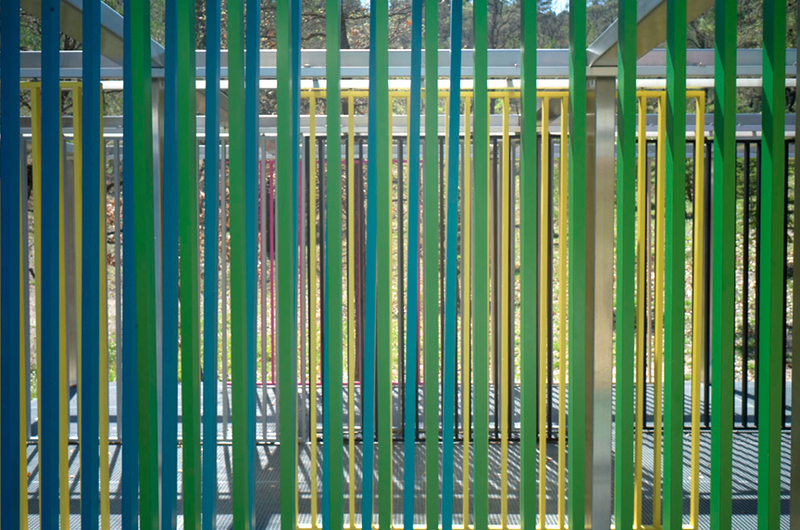 Of all the works there – and there were some by well known artists – this cage of color strips provoked me into a playful mood and made me feel the ‘quality’ of the dappled light I had experienced in the woods I walked through to get to it. How do you judge if a work works? If you feel something when you come near it, or within its space, and the feeling brings up a range of fresh sensations and thoughts, then I think it is a ‘living’ work, and becomes like nature in some strange, new way. This jungle gym of color strips made my eye work hard and set up spatial conditions and confusions that kept me engaged, and playful, which is what a work of art can do. I know that photographs, which are so tied to the material world that it is often hard to make them seem special, can, at their best moments, lift us from the bare facts and bring us a new understanding. This entry was posted in Conceptual Art, Springtime and tagged France, Landscape on April 18, 2015 by joelmeyerowitz2014. I’m so in love with your work that I can’t find the right words to describe it and why i love it. I just wanted to say that your pictures and especially your current blog shows me how a human being can see the world. Maybe how a human being should see the world. Thinking about what I see in the moment and often catching it with my camera gives me such a bliss. I thank the world that you live and do your art.